In 1994, I traveled to Columbus to watch Massillon play Toledo Start for the state title. What a glorious time it was, watching Dan Siemetz and the rest of the Tigers. I wondered at the time when we'd be coming back. Well folks, this year's team is absolutely loaded and it just might be that time. Head Coach Tim Ridgley welcomes back eight starters from last year's 18-8-1 team, including three veteran pitchers. There is also a pre-season All-American in this group. With this combination, coupled with last summer's 55-11 record playing as the Massillon Orangemen, there is tremendous excitement in the Tiger camp. "This is a strong senior class which has been playing together for four years," says Ridgley. "There are a lot of fine outstanding human beings along with talented baseball players. There is a good core of pitchers to select from including five left-handed and six right-handed. Hitting the ball is also a strong aspect of this team with balanced right and left-handed hitters. And good solid defense. We have a lot of choices as far as the players who play each individual position and who will play on the field." The infielders can only be described as solid. Around the horn it will be senior Anthony Battle at first, senior Todd Helline at second, junior Jason Savage at shortstop, and senior Chad Marceric at third. All four of these players started last year. Battle will hit cleanup. If he comes even close to last year's stats (.434 ave. and 25 rbi), he will be a absolute force in this position. Last year he played in left field and returns to the position he is most suited for. He is a big, strong kid and hits with power. Heline is strong in every facet of the game, accordingly to Ridgley. He has quick hands and exceptional speed and he knows how to get on base. Expect the green light to steal in almost any situation. But it doesn't stop there. Todd has also been selected as a pre-season 2nd Team All-American. The most versatile of this group has to be Savage. Not only does he play the high-profile position of shortstop, he is also an outstanding hitter and pitcher. Last year he averaged .424 and had an on-base percentage of 56%. That's why he will hit in the number two spot. "He is the headiest kid on the team," says Coach Ridgley. "He will play through any kind of adversity." Marceric is the power hitter of the group, leading the team last year with 11 homers. He also averaged .388 and drove in 29 runs. Chad is a 3-year starter and a considered by his coach as a solid player. Backing up the infielders will be juniors B.J. Budd, Mark Andrews, and Chris Franks, and sophomore Dan Melito, who started a few games last year. Melito will fill in for Savage when he pitches in addition to being the designated hitter. So he should be in there most of the time. Senior Dan Ackerman returns for the third year at right field, where he batted .477 last year including six doubles. The leadoff hitter, he reached base last year 61% of the time. "You know you're going to get a great effort every time he comes to the park," says Ridgley. There are a couple of new starters at the other two outfield positions, juniors Jason Abbot and Ryan Ridgley. According to the coach, Ryan is "probably one of our best defensive outfielders on the team." That's why he will play at center field. Senior Jon Stanke and junior Chris Franks will back up this group. The deepest aspect of this team is the pitching staff. "We have a lot pitchers back," says Ridgley. "We need someone to emerge as our number one from both the right side and the left side and become a dominant force, a guy who we can count on and him delivering." Leading this group are three players who combined to pitch 109 innings last year: senior Jason Weick and juniors Jason Savage and B.J. Budd. Weick posted an excellent 3.32 era last year and fanned 22% of the batters he faced. However, he has had to overcome some bad luck lately. After battling back from mononucleosis during the winter, he recently dislocated his shoulder, which has set him back some more. He may be cleared soon, but it's most important to have him at tournament time. So he will be eased in slowly. Savage had statistics last year similar to Weick's with a 3.50 era and 25% strike out percentage. Jason is not afraid of anyone. A left-hander, he has good command of his pitches and brings a full arsenal to the mound. The coach calls him a "fireball" and is really happy with his progress. Budd, another left-hander, has really matured physically which has improved his velocity. He also sports a variety of pitching deliveries designed to keep the hitters off balance. Last year he exhibited good control, walking only 9% of his opponents. All three of these pitchers are slated to start this year along with senior David Broome, who has emerged after seeing only limited time on the mound last year. The top relievers are Senior Chris Swenson, junior Jason Abbott, and junior Josh Strubel. Ridgley calls Strubel the hardest thrower on the team. Other pitchers who will see action this year include senior Jim Barkan, and juniors Mike Groff, Chris Franks and Andrew Marks, plus sophomore Dan Melito. Behind the plate will be senior Charles Hendricks, a returning starter who batted .388 last year. Junior Drew Feucht, who is an excellent catcher himself, will back him up. The focus this year will be to put out the nine players that play together the best, not necessarily the best nine players the team. "Through the course of the year we need to overcome bumps in the road such as sickness, injuries, and slumps plus others," says Ridgley. "Each and every player on this team will have a chance to win a game for us. Our success will depend upon our players meeting these challenges and being successful at them. Newcomers will have to step it up and the others will have to lead." Coach Ridgley returns for his seventh year at the helm on the strength of a 100-56 record. Supporting him will be assistant varsity coach Jamie Marceric, pitching coach Jerry Vance, JV coach Rich McClellan, and freshman coach Jerry McArthur. With the opener just days away, excitement is growing in the Tiger camp. And why not. With an outstanding group of athletes and a seasoned coaching staff, the ingredients are there to make a serious run at the state title. It seems a little early to be holding an awards banquet, for the Tigers' season is not quite over. Friday they travel to Thurman Munson stadium for a regional semifinal game against Dublin Coffman. But maybe its not too early for some back patting, for these guys certainly deserve it. Bruce Weick, father of senior player Jason Weick, emceed the event. After thanking his Booster Club staff and giving his own applauds to the players, it was time for Head Coach Tim Ridgley to address the packed audience. Coach started by acknowledging the efforts of Frank Shertzer who organizes the summer Orangeman teams. "The summer program is what makes this work," said Ridgley. "This year's players have played close to 300 games in four years. It's so difficult to coach a high school baseball team on only 27 games." Then it was time to address the seniors. "One of the most difficult things about coaching is that these kids are gone and those ties that you have with those kids are severed," said Ridgley. "I don't know anybody who works as hard as they do over the course of the year." In past years Ridgley was concerned about his teams peaking too early and not fairing well come tournament time. This year he changed the routine by rearranging the agenda to relax a bit more. The philosophy was to put a lot of pressure on them early, then back off when the tournament comes. "I smiled at them at the GlenOak game and said 'go have some fun'," said Ridgley. "I don't smile. It's not me. It must have worked." Indeed it did, for the Tigers not only beat the Golden Eagles, they went on to defeat 1999 state qualifier North Canton, Warren Howland, and Perry. Then he talked about the respect the Tigers have earned this year. When the state's second ranked team, Mansfield Madison, came in for a doubleheader, both teams were tuning up for tournament games. Neither team intended to go with their best pitcher in either game. But after Jim Barkan shut down Madison 11-3, the visitors changed course and started their ace in the second game for fear of being shutout for the day. That's respect. Then it was time for awards. Since the season is still underway and many category awards are still being contested, Ridgley limited it to varsity letters and tournament championship medals. But he did make a pointed statement. "This team is not about awards. It's the first team I've had that's not been like that. They're very focused on their mission. They have one big heart beat and it's pounding hard." The final award of the night went to his son, Ryan. "It was a difficult situation to start your own son," said dad. "But he's done a great job this year. He filled a big void. Defense I wasn't worried about. It was hitting. But he batted close to .300 this year." The future looks bright for the Massillon baseball program. The freshman team finished with a record of 18-8 and batted over .300 as a team. The JV team had a phenomenal year running off 21 straight wins before dropping the final two. They outscored their opponents 263-63, had an on-base percentage of 50% and batted .406 with eight players hitting over .400. Also, the pitching staff struck out 193 opposing batters and recorded an ERA of 2.35. The Tigers won't rebuild next year, they'll reload. Good luck to all of the Tigers against Dublin Coffman. Coach Ridgley addresses the packed audience at the awards banquet held at the Massillon Elks. 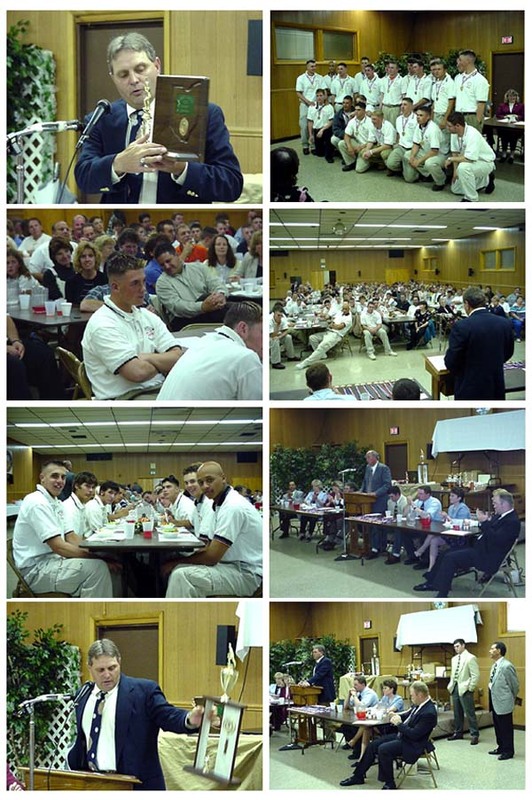 Shown below are some photos of the event held in honor of the team to recognize their outstanding accomplishments. Shown here are the trophies and medals awarded to the Massillon Tiger baseball team for the sectional and district championships. The varsity team is pictured below, with each holding their varsity letter or award. Row 1: Chad Marceric, Dan Ackerman, Jim Barkan, and Anthony Battle. Row 2: Jason Abbott, Charles Hendricks, Chris Swenson, and Jason Savage. Row 3: David Broome, Todd Helline, B.J. Budd, and Jason Weick. Row 4: Joe Nadzam, Jon Stanke, Andrew Marks, and Aaron Miller. Row 5: Josh Strubel, Dan Melito, Drew Feucht, and Ryan Ridgley. Anthony Battle is the current hitting leader with a .403 average, followed closely by Chad Marceric at .388 and Jason Savage at .386. But with Savage's .500 average in the four tournament games, the order may change by season's end. Here are the regular season baseball stats with the players shown in the order of their batting position. Following that are the stats of the substitute players. The Tigers are out-hitting the opposition by over 100 percentage points. Player AB R H RBI SO BB SB OBP Ave.
Stanke 0 0 0 0 0 0 0 n.a. n.a. B.J. Budd will lead the Massillon Tigers into the regional tournament with a win-loss record of 9-0 and an ERA of just 0.80. Against this backdrop and with a supporting cast of heavy hitters Massillon will strive to return to the state finals and finish the business started in 1994. Starting with a 1-0 win over 1999 Division 2 state champion Walsh Jesuit and continuing on throughout the tournament, Budd has been simply outstanding. Mixing a devasting fast ball with a "drop-off-the-table" slider, he has been extremely effective in keeping the hitters off balance. He has fanned 29% of the opposing batters and walked only 8%. As much as the pressure seems to be on this junior, he appears to take it all in stride; just another day at work. Budd will receive exceptional backup in junior pitchers Jason Savage and Jason Abbott. Savage has an ERA of 3.37 with most of the runs given up coming early in the season. Like Budd, he has a smoking fast ball and good curve. But beyond that, Jason brings a high level of intensity to the game whether it be pitching or field grounders from his shortstop position. Abbott sports a 4-0 record and is the pitcher of the future for the Tigers. Used sparingly early in the season, he has shown tremendous poise for a junior. His ERA is just 0.90 and he has struck out a team-high 30% of the batters he has faced. Other pitchers who could see action include Jim Barkan and Chris Swenson. Both have ERAs below 2.0. Here are the regular season pitching stats with the players shown in the order of innings pitched. Four area players gained first-team honors as the Ohio High School BaseballCoaches Association announced its All-Ohio team. Lake High School senior Matt Lorenzo capped his outstanding season by being named to the Division I first team. Lorenzo, a left-handed pitcher, was 7-2 with a 0.80 ERA and 75 strikeouts in 57 1/3 innings in leading the Blue Streaks to a 19-8 record and a share of the Federal League title. In Division II, Dover outfielder Steve Caravati was named Player of the Year while being named to the first team. Caravati led the area with a .671 on base percentage and 16 home runs. In Division II, third baseman Shawn Wright of Carrollton joined Caravati on the first team. Wright hit .448 with 26 RBIs. In Division III, Tuslaws third baseman Mike Crescenze earned first-team honors. Garnering second-team honors in Division I are a pair of Massillon players, second baseman Todd Helline and third baseman Chad Marceric. Pitcher John Redmond of Jackson earned honorable-mention honors. Scott Power of Carrollton was named to the second team in Division II, while Central Catholics Brady Steineck earned honorable-mention honors. PMatt Lorenzo, Lake; Jeff Kennard, Centerville. CJohn Johnson, Tol. Woodward. 1BTim Stacey, Solon. 2BBrian Meyer, North Royalton. 3BMarc Franz, Defiance. SSDan Lunsford, Mans. Madison. OFPhil Bojc, Euclid; Michael Ferris, Cin. Colerain; Brian Hirsch, Solon. DHJimmy Williams, Mans. Madison. Player of the Year: Daniel Lunsford, Mans. Madison. Coach of the Year: Tim Saunders, Dublin Coffman. PGreg McKenzie, Madison; Michael Myers, Dublin Scioto. CClay Desantis, Westerville North. 1BTravis Boley, Celina. 2BTodd Helline, Massillon Washington. 3BChad Marceric, Massillon Washington. SSChristian Snavely, Defiance. OFJason DeSatnik, Mayfield Village Mayfield; Eric Heminger, Hilliard Davidson; Brandon OBrien, Mans. Madison. DHDan Donatelli, Mayfield Village Mayfield. PTodd Brown, Washington CH; Zack McKinney, Lakewood. CJon Slaughter, Tipp City Tippecanoe. 1BDavid Snapp, Lewistown Indian Lake. 2BJason Keeling, Cols. Watterson. 3BShawn Wright, Carrollton. SSMatt Barhurst, Tipp City Tippecanoe. OFBryce Bednarcyzk, Lakewood; Steve Caravati, Dover; Brandon Cornell, Cols. Watterson. DHSteve Snyder, Avon Lake. Player of the Year: Steve Caravati, Dover. Coach of the Year: Don Thorpe Lakewood. Rodney Brewer, Bryan; Tony Ebersole, Bryan; Brett Myers, Ottawa-Glandorf; John Ross, Avon Lake; Dan Zahler, Chesterland W. Geauga; Adam Cox, Vandalia-Butler; Zac Janicek, Avon Lake; Ryan Lucas, Tipp City Tippecanoe; Brady Steineck, Canton Central Catholic. PJosh Newman, Wheelersburg; Aaron Walker, East Palenstine. CLuke Speck, Pemberville Eastwood. 1BPaul Wesrling, Coldwater. 2BJustin Hill, Granville. 3BMike Crescenze, Tuslaw. SSJosh Pyles , Plain City Jonathan Alder. OFMatt Foster, Granville; Josh Stephen, Gnad. Indian Valley; Troy Temple, Rockford Parkway. DHKyle Blachuta, Bloomdale Elmwood. Player of the Year: Mike Breyman, Attica Seneca E.
Coach of the Year: Gary Nissen, Genoa Area. PKyle Blachuta, Bloomdale Elmwood; Brent Ewing, Wellston. CDerek Stanfield, Columbiana. 1BMike Breyman, Attica Seneca E. 2BJeff Lowe, Bellefontaine Benjamin Logan. 3BJohn Franks, Burton Berkshire. SSRyan Rummell, Coldwater. OFDustin Adkins, Lucasville Valley; Adam Brokaw, Bellville Clear Fork; Bill Thomas, New London. DHMike Breyman, Attica Seneca E.
Derek Adkins, Lucasville Valley; Ben Tuttle, Minford; Bill Mulla, Columbiana; Adam Smith, Columbus Grove; Jason Green, Minford. PChad Petty, Southington Chalker; Neil Schmitz, St. Henry. CAdam Morgan, Southington Chalker. 1BBrad Pettigrew, Newark Cath. 2BPhil Faires, Glouster Trimble. 3BBob Heitkamp, Ft. Recovery. SSRyan Barnett, Mowrystown Whiteoak. OFJustin Bennington, Fairfield; Chad Reineke, Def. Ayersville; Kendall Schlabach, Berlin Hiland. DHBrent Bohman, St. Henry. Player of the Year: Chad Petty, Southington Chalker. Coach of the Year: Todd Karako, Fairport Harding. PMitch LeMasters, Toronto; David German, Tipp City Bethel. CAnthony Owens, Willow Wood Symmes Valley. 1BNeil Schmitz, St. Henry. 2BBrent Koesters, St. Henry. 3BDan Cannon, Fairfield. SSMat Plunkett, Bethel. OF Mike Rupinsky, Warren Kennedy; Ryan Stevenson, Sidney Fairlawn; John Zinnicker, Fairport Harbor Harding. DHDave Jamieson, Ottawa Hills. Ben Dennison, N. Lewisburg Triad; Brad Lemon, S. Charleston Southeastern; Tom Pickering, Newark Cath. ; Mike Ward, Fairport Harbor Harding; John Hatfield, Crestline. CANTON  The annual Hank Miller All-Star Baseball Games, featuring seniors from Stark Countys larger high schools, will be played tonight at GlenOaks baseball stadium. The first game begins at 5:30. The North, featuring seniors from Jackson, Louisville, North Canton, McKinley, Lake and Canton South, will play the South, featuring players from GlenOak, Alliance, Massillon, Timken and Marlington. Two seven-inning games will be contested. Rocky Bourquin of Canton South, Tom Yingling of Jackson and Mark Kremer of Lake will coach the North, while Massillons Tim Ridgely, GlenOaks Joe Gilhousen and Alliances Shawn Alazaus will coach the South. The Jack Garber Award will be presented to the Most Valuable Player of the South team, while the Robert Fife Award goes to the MVP of the North. The Hank Miller Award will go to the series MVP. McKinley head baseball coach Bob Neff is the tournament director. North Canton: Doug Yoder, 1B; Judd Allen, P; Mike Grady, P; Sam Simmerman, C; Brian Kehner, 3B. McKinley: Matt Byrd, 3B; John Umberger, C; Steve Larson, P. Lake: Matt Lorenzo, P/3B; Kris Koran, SS; Dustin Shrock, OF. Louisville: Jason Archer, P/SS; Sean Zustin, 2B; John Herbert, OF; Nathan DeGasperis, 1B. Jackson: Bret Blackstock, SS; Eric Scott, 1B; John Redmon, P/OF; Nick Evans, P/OF. Canton South: Bill Hanson, P/OF; Andy Hussar, C; Dean Roach, 2B. Timken: Randall Ramsey, 2B/P; Joe Rue, OF. Massillon: Chad Marceric, 3B; Anthony Battle, 1B; Charles Hendricks, C; Todd Helline, 2B. Alliance: Tony DeGirolamo, SS; Josh Meiring, P/OF; Dustin Johnson, 3B. GlenOak: Matt McFarland, 2B; Nate Knobel, P; K.C. Sanders, C; Mike Beard, P/3B. Marlington: Doug Haidet, 2B; Larry Scarbrough, OF; Justin McCarty, OF. Perry: Moe Elum, P/INF; Josh Mayle, P/OF; Glen Schering, P/1B; Brandon Villilo, P/3B. Second Ten: 11.Lakewood(31),12.Centerville(30), 13.North Canton Hoover(30), 14.Fairfield(29), 15.Toldeo St. Francis(27), 16.Pickerington(24), 17.Uniontown Lake(19), 18.Euclid(18), 19.Canton GlenOak(17), 20. Massillon Washington(13). Second Ten: 11.Columbus St. Charles(38), 12.Tallmadge(37), 13.Sandusky Perkins(1)(37), 14. Columbus DeSales(31), 15.Alliance(28), 16.Columbus Watterson(26), 17.Parma Heights Holy Name(20), 18.Milan Edison(20), 19.Norwood(19), 20.Hamilton Badin (18). Second Ten: 11.Campbell Memorial(27), 12.Batavia(17), 13.Wellston(17), 14.Johnstown Monroe (11), 15.Cincinnati St.Bernard Elmwood Place(11), 16.Columbiana Crestwood(10), 17.Germantown Valley View(10), 18.Berlin Center Western Reserve(10), 19.Bellefountaine Benjamin Logan(8), 20.Oak Hill(7). Second Ten: 11.Bellaire St. John(35), 12.Leeburg Fairfield(1)(27), 13. Cincinnati Country Day(27), 14.Steubenville Catholic Central(22), 15.Ashland Crestview(21), 16.Southington Chalker(20), 17.Morral Ridgedale(17), 18.Mineral Ridge(16), 19. Ft. Recovery(13), 20. Acadia(12). Second 10: 11, Logan 31. 12, Mayfield Village Mayfield (1) 29. 13, Fairfield 24. 14, Canton GlenOak 21. 15, Dublin Coffman 20. 16, Uniontown Lake 19. 17, N. Canton Hoover 18. 18, Solon 15. 19, Mass. Washington 13. 20, Westerville North 12. Second 10: 11, Cuya. Falls Walsh Jesuit 43. 12, Galion 39. 13, Parma Hts. Holy Name 38. 14, Mentor Lake Cath. 36. 15, Ham. Badin (1) 31. 16 (tie), Bellefontaine, Alliance 28. 18, Wooster Triway 23. 19, Tallmadge (1) 19. 20, Trenton Edgewood 17. Second 10: 11, Campbell Memorial 32. 12, Johnstown Northridge 27. 13 (tie), Cin. Madeira (1), Ash. Crestview 21. 15 (tie), Mass. Tuslaw, Batavia 20. 17 (tie), W. Lafayette Ridgewood, Minford 13. 19, Columbiana 10. 20 (tie), Lynchburg-Clay, Granville 9. Second 10: 11, Ottoville 42. 12, Southington Chalker 41. 13, Delphos St. John's 26. 14, Crestline 24. 15, Cin. Landmark Christian 13. 16, Young. Stritch 8. 17 (tie), Cin. Country Day, Bellaire St. John, Middletown Fenwick 7. 20, Mineral Ridge 6. Second 10: 11, Lakewood (1) 46. 12, Brunswick 45. 13, Mayfield Village Mayfield (1) 42. 14, Solon 33. 15, Mass. Washington 27. 16, Westerville North 16. 17, Uniontown Lake 16. 18, Canton GlenOak 15. 19, Huber Hts. Wayne 13. 20, Piqua 12. Second 10: 11, Cols. Watterson 34. 12, Portsmouth 32. 13, Parma Hts. Holy Name 30. 14 (tie), Cuya. Falls Walsh Jesuit, Dresden Tri-Valley 24. 16, St. Marys Memorial 23. 17, Tallmadge 19. 18, Mentor Lake Cath. 18. 19, Ham. Badin 16. 20, Bellefontaine 11. Second 10: 11, Plain City Jon. Alder 47. 12, Cin. Madeira (1) 42. 13, Granville 32. 14, Batavia (1) 25. 15, Lynchburg-Clay 22. 16, New London 19. 17 (tie), W. Lafayette Ridgewood, Campbell Memorial 17. 19, St. Bernard-Elmwood Place 15. 20, Mass. Tuslaw 13. Second 10: 11, Crestline 49. 12, Ottoville 35. 13, Young. Stritch 23. 14 (tie), Delphos St. John's, Ft. Recovery 20. 16, W. Unity Hilltop 18. 17, Lanc. Fisher Cath. 14. 18, Mowrystown Whiteoak 12. 19, Cin. Landmark Christian 8. 20, Ft. Loramie 7. Second 10: 11, Lakewood 48. 12, Brunswick 31. 13, Centerville 29. 14, Mass. Washington 28. 15, Grove City 27. 16 (tie), Tol. Waite, Hamilton 23. 18, Euclid 20. 19, Uniontown Lake 19. 20, Miamisburg 16. Second 10: 11, Parma Hts. Holy Name 39. 12, Washington CH 31. 13, St. Marys Memorial 29. 14, Tallmadge 28. 15, Bellefontaine 21. 16, Ham. Badin 17. 17, Desden Tri-Valley 16. 18, Cols. Watterson 15. 19, Cuya. Falls Walsh Jesuit. 14. 20., Cols. St. Charles 13. Second 10: 11, Plain City Jon. Alder 37. 12, Cin. Madeira (1) 33. 13, Ger. Valley View 28. 14, Batavia (2) 27. 15, Gnad. Indian Valley 23. 16, New London 20. 17, Cin. N. College Hill 17. 18 (tie), Cin. Tuslaw, Day. Oakwood 12. 20, Lynchburg-Clay 11. Second 10: 11, Ottoville 46. 12, W. Unity Hilltop 40. 13, Leesburg Fairfield 22. 14, Fayetteville-Perry 16. 15 (tie), Crestview, Tipp City Bethel 11. 17 (tie), Delphos St. John's, Young. Stritch 8. 19 (tie), W. Liberty Salem, Cin. Landmark Christian 7. Baseball America's High School Poll is chosen by Baseball America in conjunction with the National High School Baseball Coaches Association. Records indicated are final 1999 records. Records through April 29. The next poll will be released May 8. Gloucester Catholic HS, Gloucester City, N.J.
West Torrance HS, Torrance, Calif.
Lowndes County HS, Valdosta, Ga.
Westlake HS, Westlake Village, Calif.
Temecula Valley HS, Temecula, Calif.
Barbe HS, Lake Charles, La. Canyon del Oro HS, Tucson, Ariz.
Riverdale Baptist HS, Upper Marlboro, Md. T.C. Roberson HS, Asheville, N.C.
Cretin-Derham Hall HS, St. Paul, Minn. DROPPED OUT: No. 9 Kamiakin HS, Kennewick, Wash. (12-2); No. 12 Tupelo, Miss., HS (29-4); No. 15 Green Valley HS, Henderson, Nev. (20-4); No. 16 Fountain Valley, Calif., HS (17-6); No. 17 Jenks, Okla., HS (33-5); No. 18 Palm Beach Gardens, Fla., HS (27-3); No. 19 Clovis, Calif., HS (20-4); No. 20 Tate HS, Gonzalez, Fla. (24-6); No. 21 Hoggard HS, Wilmington, N.C. (20-2); No. 22 Germantown, Tenn., HS (26-3); No. 23 Blue Springs, Mo., HS; No. 25 Key West, Fla., HS (23-7). Records through May 6. The next poll will be released May 22. South Kitsap HS, Port Orchard, Wash. DROPPED OUT: No. 22 Duncanville, Texas, HS (25-3); No. 23 Pleasure Ridge Park HS, Louisville (18-2). Copyright 1998-2000 Baseball America. All rights reserved. The first in-season poll will be released on March 13. Broncos have talent up and down lineup, from potential first-rounders Scott Heard and Matt Wheatland to freshman sensation John Peabody. Defending 6-A state champs return LHP Sean Burnett (12-1, 1.30), C Rob Orton (.422-4-33) and 3B Brian Snyder (.396-4-35). LHP Dane Artman (8-0, 0.15 at Key West High) and Florida-bound C Mike Murray and RHP Scot Drucker are among 11 transfers. Reigning 5-A champions favored to repeat with return of six regulars, including SS Enrique Cruz (.512-10-53) and RHP Adam Laird (9-0, 0.85). Golden Bears feature four Cal State Fullerton signees, led by 3B Kyle Boyer (.565-7-33) and SS David Garcia (.436-8-40). Raiders feature four Division I recruits, led by SS/RHP David Espinosa (.430-8-36, 35 SB; 5-1, 1.20) and LHP Travis Nesmith (5-0, 1.30). Celtics have solid pitching tandem in senior LHP Carmen Pignatiello (11-1, 1.28) and junior Kris Honel (7-1, 0.73). Rams, led by RHP Greg Burke (10-2, 1.93), havent had a losing season in 25 years, and this may be their best team ever. Sailors look to return to national prominence with a lineup that returns every regular position player and ace LHP Jason Miller (9-1, 1.29). Trojans lose little from 1999; among returnees are C David Castillo (.527-0-42) and RHP/SS Gene Flores (9-1, 2.19; .360-0-15). RHP-3B Jason Smith (6-3, 4.16; .376-2-29) is one of seven starters from team that finished second at 99 American Legion World Series. Coach Ron LaRuffa returns after one-year absence and welcomes back 3B Casey Janssen (.348-3-24) and SS John Clark, a key transfer. Warhawks seven best players are juniors, including 1B Casey Kotchman (.400-4-26) and RHP Ryan Dixon (5-3, 5.37). Skyhawks boast six Division I signees, including 1B Jeremy West (.576-6-30) and C Thomas Rojas (.425-3-36). 1B-LHP James Holder (.395-7-33; 0-1, 2.92) heads up Bells best team since Pat Burrell-led squad was contender in 1994. 3-A champs return RHP/1B Jason Sharber (6-1, 2.48; .347-8-27), SS Chuck Akers (.410-5-33) and junior OF Jeremy Slayden (.448-13-52). Bucs made a run at a national title a year ago and return junior 3B Austin Nagle (.520-17-58) and 1B Eric Bruchhaus (.393-6-41). OF Javon Moran (.414-11-26) is Vikings best player, but keep an eye on junior SS Stephen Drew (.559-6-23), J.D.s brother. Even with a school enrollment of 100, Panthers feature a deep pitching staff led by senior LHP Denny Hernandez (9-4, 0.98). Lineup features C Matt Cunningham (.510-2-29) and SS Jonathan Brewster (.438-5-22), but Knights need reliable arms. RHP/3B Kenny Nelson (9-2, 1.79; .389-14-45) and LHP-OF Joe Kemp (5-0, 2.17; .417-8-22) are two-way players for Crusaders. Dorados have one of nations best two-way talents in Arizona State-bound RHP/C Ryan Schroyer (7-2, 2.30, .400-6-29). With LHP Justin Simmons (14-2, 1.51) and RHP Michael Garza (10-4, 3.25) back, Panthers could push Bellaire to the wire again. RHP Tom Graham (12-2, 1.81) and OF Wes Moyer (.514-8-26) return, and Cougars get standout junior C Landon Powell, who missed 99 with injury. With LHP/OFs Brandon Mims (12-1, 1.71; .432-13-47) and Chad White (10-2, 1.22; .361-6-24), Lions hope to upstage Vestavia Hills. Warriors had a record six players participate in Area Code Games, including junior RHP/1B Tyler Adamczyk (3-0, 4.32; .450-7-23). Trojans lose a ton of talent from 99 national champions, but C Rusty Krueger (.303-4-21) and 1B Kevin Gergel (.420-8-46) are three-year regulars. Seniors Dave Krynzel (.400-4-27) and Ben Schiess (.416-7-29), and junior Garrett Guzman (.514) form nations best outfield. Dragons return 22 lettermen, including seven starters and top pitchers Bobby Sawicki (11-1, 2.29) and Joey Guarjardo (9-2, 1.74). Mavericks just missed a state title last year and return two top pitchers, LHP David Marchbanks (7-2, 3.43) and RHP Chris Carter (11-1, 3.26). Two-time Oklahoma 6-A champion Rams return RHP Mark Roberts (14-1, 2.05) and 3B Scott Campbell (.402-8-36), and added three transfers. Monarchs return C Josh Hansen (.438-12-40) and welcome transfer SS Sergio Santos (12 HRs, 43 RBIs as a freshman). Crusaders are led by star C Tony Richie (.580-9-56) and Rumble twins, Pat (.451-4-13; 4-2, 2.05) and Matt (.374-4-17). C Ryder Mathias (.451-7-21) and 3B/RHP Scott Schade (.434-8-28) give Green Dragons two frontline players. Perennial Ohio power lost in district play a year ago, but returns solid nucleus led by three Division I signees and junior C Matt Birr (.408). Vikings pin hopes on LHP/OF Scott Senatore (9-2, 1.73; .390-2-20) and RHP/SS Tommy Bowker (8-0, 2.75; .267-0-14). Wolves return nucleus from sectional runners-up, led by junior SS Dustin Pedroia (.448-2-29) and RHP Paul Pinegar (9-1, 1.29). California sectional champions in 99, Indians return RHP-1B Jamie Shields (11-0, 2.35; .478-11-45), one of nations top pitchers. Senior OF Jose Cruz (.363, 8 SB) provides speed; sophomore 1B Prince Fielder (.385-6-33), Cecils son, provides power. Panthers return strong nucleus, including 1B Jonathan Hamilton (.437-10-53) and SS Eric Schindewolf (.461-2-31). Trojans will be a force with four Division I prospects, including LHP/OF Buddy Blair (5-4, 2.60; .358-4-26) and OF Tyler Johnson (.443-10-41). Led by senior C Cory Agar (.439-5-40), Falcons return nucleus of team that was ranked No. 1 in Florida 5-A classification most of 99. SS Chris Patrick (.369-1-12), son of the Cougars coach, played on teams that finished in top three in 97-98, and now is teams best player. Division I-bound pitchers Bob Keppel (5-0, 1.13), Don Rogers (3-3, 4.86) and Bob Zimmerman (2-4, 3.56) give Spartans an edge. Golden Wave has an experienced hitting team, led by two Mississippi State recruits: OF Jonathan Bell (.394-8-38) and C Reed Hawkins (.402-4-34). Red Raiders, winners of three New York large-school titles in 90s, return seven key regulars, including LHP Justin Ottman (7-1). Highlanders will pin their state-title hopes squarely on one player, Texas-bound OF-LHP Vince Sinisi (.544-9-42; 11-1, 2.08). RHP/OF Mark Galvin (14-1, 1.42; .377-7-34) and RHP/SS David Hughes (7-2, 1.45; .509-6-32) are solid two-way players for Panthers. Defending 4-A champs return three-year starters: RHP/1B Sean Rierson (11-1, 1.53, .474-0-25) and C Jeff Lundgren (.384-1-25). Conchs lost star LHP Dane Artman to a rival, but OF Ben Harrison (.407-5-26) and RHP Daniel Hersey (10-1, 1.57) lead a veteran team. Copyright 1998-1999 Baseball America. All rights reserved. Outlook: Six starters and Nos. 2-3 pitchers return from school's first San Diego Section Division I champion. Five seniors, including four possible pro draftees, and five underclassmen have Division I potential. The nation's premier catcher, Scott Heard, will be able to hit this year. Outlook: Defending Class 6A champion hopes to repeat with strong veteran nucleus, bolstered by two talented transfers. LHP Sean Burnett was 12-1 with three saves and a 1.30 ERA, striking out 135 and walking 18 in 86 1/3 innings. Catcher Robbie Orton batted .422 with 33 RBI. Outlook: Class 2A champion has 15-game winning streak and 11 transfers representing 10 schools. Dane Artman (6-3, 205) was 8-0 with a 0.15 ERA as junior at Key West. Outlook: Six returning starters and top five pitchers will be joined by all-CIF shortstop John Clark from Ocean View (Huntington Beach). RHP-3B Casey Janssen (6-3, 190) batted .348 with 24 RBI and was 1-1 with four saves as junior. Outlook: USA TODAY's defending national champion again will be in the title chase, returning six starters plus No. 2 pitcher Adam Laird, who was 8-0 as sophomore with 0.85 ERA. SS Enrique Cruz batted .512 as junior with 18 doubles, 55 runs and 53 RBI. Outlook: Strong contender for Class 5A title with seven starters and three of top four pitchers returning. RHP-SS Joey Guajardo was 9-2 with 1.74 ERA and batted .327 with 24 RBI as sophomore. RHP-SS Bobby Sawicki was 11-1 with 2.29 ERA and batted .324 with 22 runs and 25 RBI as junior. Outlook: Four pitchers and five starters return. Strength was apparent when team won summer state title. LHP Carmen Pignatiello was 11-1 last year, striking out 115 in 76 innings. RF Pat Flynn batted .485 with 15 doubles and 51 RBI. Outlook: Two-time defending Group IV champion has five returning starters and top four pitchers. RHP Michael Rogers was 11-2 with 1.21 ERA. LF Scott Rich batted .382 with school-record 42 RBI as junior. Senior SS Joe Hernandez batted .506. Outlook: Defending Parochial A champion welcomes back nine starters and top three pitchers. RHP Greg Burke (6-4, 190) was 10-2 with 1.93 ERA as junior. Another senior right-hander, Chris Della Rocco, was 7-1 with 1.96 ERA. Outlook: Hopes to replace Vestavia Hills (Birmingham) as No. 1 state power with six returning starters and top four pitchers. LHP Brandon Mims (6-2, 190) was 12-1 with 1.71 ERA, striking out 150 in 94 1/3 innings. He also batted .432. LHP Chad White was 10-2 with 1.22 ERA and batted .361. Outlook: Three North Carolina State signees return from a team that belted school-record 45 home runs. LHP-1B David Hicks (6-4, 220) had 12 HRs and 36 RBI. SS Lee Kimball had 11 HRs and 18 RBI. Outlook: C-RHP Ryan Schroyer heads veteran team that returns top four pitchers. Arizona State signee Schroyer (5-11, 195) batted .400 with 29 RBI and was 7-2 with 2.30 ERA. 2B-SS Ian Kinsler batted .395 with 21 RBI. Outlook: Defending Class 3A champion starts season with 22-game winning streak and good nucleus. Power-hitting RF Jeremy Slayden batted .448 with 13 HRs and tied school record with 52 RBI as sophomore. CF-SS Chuck Akers batted .410 with 33 RBI and school-record 61 runs. Outlook: Defending Class 6A champion bolstered by three transfers. 3B Scott Campbell batted .443 with 47 runs and 36 RBI as junior, and OF Cory Patton batted .402 with 49 RBI. RHP Mark Roberts was 14-1 with 2.05 ERA. Outlook: Senior OFs Javon Moran and Zane Green will get welcome support from junior SS Stephen Drew, younger brother of Tim and J.D. Drew. Moran batted .410 as junior; Green batted .414 and had 2.85 ERA. Drew batted .569 with 23 RBI in 16 games. Outlook: Outstanding senior class, which includes seven Division I players, should propel Class 5A state runner-up to elusive title. Senior LHP-1B Eric Bruchhaus batted .393 with 41 RBI. Senior 3B Chad Carnahan batted .341 with 29 RBI. Junior CF-3B Austin Nagle batted sizzling .520 with 17 HRs and 58 RBI. Outlook: Strong veteran nucleus enhanced by two talented transfers. Senior RHP Kenny Nelson was 9-2 with four saves and 1.79 ERA. He also batted .369 with school-record 14 HRs and 45 RBI. Senior LHP-CF Joe Kemp batted .417 with 17 doubles and 25 RBI and was 5-0 with 2.17 ERA. Outlook: Northern California's No. 1 team will be led by LHP-1B J.D. Cockroft, who was 6-1 with 2.15 ERA as junior. LHP-1B James Holder (6-5, 205) batted .395 with 33 RBI as junior. Senior 2B Kevin Frandsen batted .393 with 16 RBI. Outlook: Every starter and top four pitchers return, paced by SS David Espinosa, who batted .519 with eight HRs, 25 RBI and 35 stolen bases as junior. Senior C Javier Herrera batted .420 with 34 RBI. Senior LHP Travis Nesmith (6-3, 200) was 5-1. Outlook: Junior LHP Taylor Tankersley is key returnee, having posted an 11-2 record with 0.62 ERA last year. Sophomore RHP-LF Brian Pettway was 4-0 with 1.43 ERA and batted .457. Senior catcher Craig Newton batted .377 with 37 RBI. Outlook: Has a 20-game winning streak and top four pitchers to carry load. Junior RHP Chad Braniff was 7-0 with 1.03 ERA last year for the Class AAA champ. RHP Ben Lefever was 6-1 with 2.84 ERA and batted .333 with five triples. Junior catcher Adam Witter batted .323 with 25 RBI. Outlook: Defending Class 4A champion will count on LF Tony Hanks, who batted .420 with 27 RBI last year, and SS Britt Bearden, (.407 with nine HRs and 42 RBI). Junior RHP Aaron Rawl was 9-1 with 2.03 ERA. Outlook: LHPs Kris Krstich (13-1, 2.30 ERA) and Matt Lestan (12-2, 2.56 ERA) lead deep staff. SS Jim Geldhof batted .468 with 10 HRs and 16 doubles last year. Catcher Tony Cribari batted .415 with 12 HRs and team-high 54 RBI. Outlook: Seven starters return. Top three pitchers played for American Legion national runner-up. RHP-3B Jason Smith was 6-0 with 2.57 ERA and batted .376 with 29 RBI. CF Matt Smith (no relation) batted .402 with 24 RBI. Outlook: Arizona State signee Jeremy West provides power at first base, having batted lusty .576 with six HRs and 30 RBI as junior. Catcher Tommy Rojas batted .425 with 36 RBI, and LHP Robbie Van was 5-2 with 2.77 ERA. South: 1. Wellington, West Palm Beach, Fla. (33-4); 2. Westminster Academy, Fort Lauderdale, Fla. (33-2); 3. Bellaire, Houston (38-2); 4. Round Rock, Texas (26-4); 5. Prattville, Ala. (42-8); 6. Broughton, Raleigh, N.C. (13-10); 7. Oakland, Murfreesboro, Tenn. (37-2); 8. Lowndes County, Valdosta, Ga. (26-5); 9. Barbe, Lake Charles, La. (36-3); 10. Gulliver Prep, Miami (24-8). East: 1. Steinert, Hamilton Township, N.J. (29-3); 2. Gloucester Catholic, Gloucester City, N.J. (27-4); 3. Riverdale Baptist, Upper Marlboro, Md. (35-4); 4. Chambersburg, Pa. (27-2); 5. North Allegheny, Wexford, Pa. (17-4); 6. Mount St. Joseph, Baltimore (22-6); 7. Cathedral Prep, Erie, Pa. (19-7); 8. Danvers, Mass. (25-1); 9. Jefferson, Shenandoah Junction, W.Va. (32-4); 10. Rockville, Vernon Rockville, Conn. (20-5). West: 1. Rancho Bernardo, San Diego (24-6); 2. Fountain Valley, Calif. (16-10); 3. Canyon del Oro, Tucson, Ariz. (25-7); 4. Bellarmine Prep, San Jose (29-7); 5. Kamiakin, Kennewick, Wash. (21-4); 6. Silverado, Las Vegas (18-7); 7. Temecula Valley, Temecula, Calif. (21-6); 8. Green Valley, Henderson, Nev. (19-8); 9. Wilson, Long Beach, Calif. (26-5); 10. Richland, Wash. (23-3). Midwest: 1. Providence Catholic, New Lenox, Ill. (30-3); 2. Owasso, Okla. (39-5); 3. Troy, Mich. (33-7); 4. Jenks, Okla. (23-16); 5. Elder, Cincinnati (27-7); 6. Carmel, Ind. (21-9); 7. DeSmet, St. Louis (19-13); 8. Carmel, Mundelein, Ill. (35-6); 9. Millard West, Omaha (28-4); 10. Start, Toledo, Ohio (23-3). FULLERTON, Calif.--For more than a decade, the National Classic has showcased some of the nation's top high school teams and players. 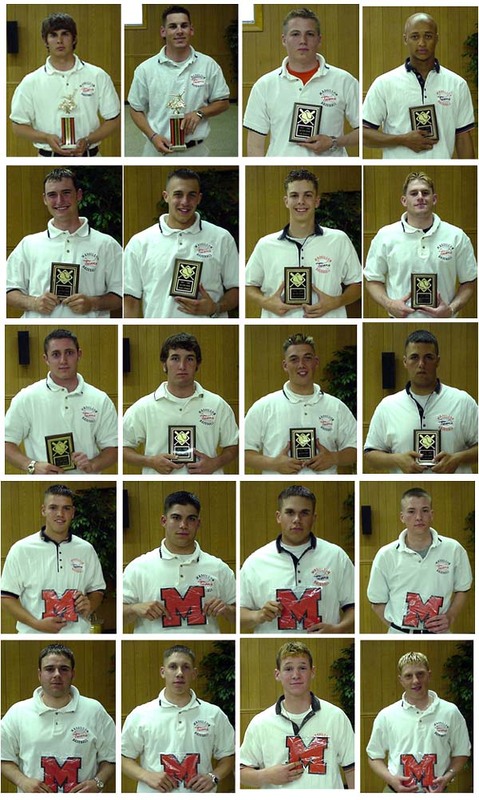 That tradition continued in 2000 with a tournament featuring seven teams from Baseball America's preseason top 50 and dozens of players headed for professional or college ball. Gulliver Prep of Miami, a team that opened the season ranked seventh but fell out of the poll early on, is now likely to get back in. The Raiders (23-4) won the tournament with a convincing 7-2 victory over upstart Palm Bay of Melbourne, Fla., in the title game. All four Florida teams in the event comprised its final four after winning one-run quarterfinal games. Gulliver Prep responded to an early slump with a 15-game winning streak that ended before it headed west. It reached the title game with victories over No. 19 Clovis (Calif.), El Dorado of Placentia, Calif., and Cooper City (Fla.). Starter Adam Acosta allowed one run over four innings against Palm Bay. He gave way to Tennessee-bound Travis NeSmith, who struck out five and gave up one hit in his relief stint. Center fielder Dan Figueroa doubled home three third-inning runs, and cleanup hitter Dennis Gomez added three hits and two RBIs. Acosta (7-0) won three games and shortstop David Espinosa hit .600-3-6 with eight runs to earn tournament MVP honors. The Raiders outscored their opponents 38-15 in four games. "When we put it all together, I don't think there's a team in the country that can beat us," Espinosa said. "If we hadn't lost those three games, which we shouldn't have, we'd definitely be ranked." Palm Bay (20-8) reached the championship game by beating Shadow Mountain (Phoenix), Silverado (Las Vegas) and No. 1 Wellington (Fla.). Wellington scored 12 first-inning runs on its way to a 20-4 victory over Cooper City in the third-place game. No. 16 Fountain Valley (Calif.) defeated Silverado 6-4 in the fifth-place game. Wellington ace lefthander Sean Burnett pitched a one-hitter in a 1-0 win over Esperanza of Anaheim in the quarterfinals. The only hit was an infield single by Matt Parrish, whom Burnett promptly picked off. Burnett outdueled Esperanza lefthander Chris Brown, who allowed three hits. Woodland (Calif.) beat Clovis 4-3 in the consolation championship game, with shortstop Dustin Pedroia supplying most of the heroics. The 5-foot-9, 155-pound junior belted a three-run homer in the third inning, and also robbed two Clovis batters of hits and RBIs by starting two double plays, including one in the final inning. "I wouldn't trade him for any shortstop in America," said Woodland coach Bob Rinaldi. "He's the heart of our team." National No. 1 Wellington lost for the first time this season, albeit narrowly, in Thursday's National Classic semifinals. Wellington actually came back from a 6-1 deficit, tying the game on Bo Diaz' infield single in the bottom of the seventh. But Palm Bay advanced to Friday's finals thanks to Billy Rightmire's RBI single in the eighth. The Wolverines nearly came back again in the bottom of the eighth, loading the bases before winning pitcher David Danowski retired Robbie Orton on a ground ball to end the game. The consolation finals, featuring California teams Clovis and Woodland, are also Friday. The state of Florida remained perfect Wednesday as the four schools from that state filled the four semifinal berths. All of them won one-run quarterfinal games to advance. Wellington ace lefthander Sean Burnett pitched a one-hitter to turn aside Esperanza. The only hit was an infield single by Matt Parrish, whom Burnett promptly picked off. Burnett outdueled Esperanza lefthander Chris Brown, who allowed three hits. The other three teams all came from behind, with Palm Bay scoring five times in the seventh inning to beat Silverado. Burt Clark hit a decisive three-run home run in that game, then pitched a 1-2-3 bottom of the seventh. Thursday's semifinal matchups are Wellington-Palm Bay and Gulliver Prep-Cooper City. The rain-delayed first-round was completed Tuesday, with four Florida teams and three from California among the eight teams staying in contention for the championship. Highly touted prospect David Espinosa hit two solo home runs for Gulliver Prep in its win over Clovis, and also pitched the last 1 1/3 innings. Wednesday's winners' bracket matchups were Wellington-Esperanza, Palm Bay (Melbourne, Fla.)-Silverado (Las Vegas), Gulliver Prep-El Dorado and Fountain Valley (Calif.)-Cooper City. The remainder of the tournament has been moved back a day, with the championship round now scheduled for Friday. Just three of eight games were completed Monday in the National Classic high school tournament in Orange County, Calif., as rain played havoc with the opening-round schedule. One of those three games was rain-shortened, with the rain actually changing the result. Fountain Valley (Calif.) led Taylorsville (Utah) 4-3 through five innings. Taylorsville took the lead 7-4 in the top of the sixth on Chris Mower's grand slam, but the rain stopped the game before Fountain Valley could bat in the bottom of the inning. The result reverted to five innings, with Fountain Valley winning. Only high school seniors are eligible for this list (and the 2000 draft). *College commitment in NCAA early signing period. Baseball Americas 2000 Preseason High School All-America team was selected based on observations by Baseball America staff members David Rawnsley and Allan Simpson and feedback from more than 40 scouting directors and major college recruiters. The criteria for selection is weighted more toward a players future potential than his performance to date. The text (follow links on first-team players) was written by Rawnsley. Strengths: Complete defensive package, lefthanded-hitting ability. Heard will be in competition for more than just the No. 1 pick in the draft this spring. His prospect-laden Rancho Bernardo team could challenge for a national high school title as well. Since he first played in the Area Code Games after his freshman year, Heard has been well known to scouts, primarily for his defense. As a junior, a nagging wrist problem was misdiagnosed and he missed almost all spring with what was eventually determined to be a fractured hamate bone. That inactivity and Heards formerly narrow upper body put some question into scouts minds about his offensive potential. But he answered those concerns in the fall by adding close to 15 pounds of muscle through intensive work with a personal trainer. He now weighs in at 190, with significantly increased raw power. Weaknesses: Patience at the plate, quickness. Sam Carpenter, coach of the national powerhouse Dallas Mustangs summer team, called Stokes the most impressive power hitter hes had. Considering two of Carpenters recent stars were Ben Grieve and Vernon Wells, thats high praise. Stokes hit a team-record 32 home runs during the Mustangs two-month schedule last summer. Stokes has good arm strength and speed for his size, and was playing some outfield early this spring. But his future will clearly be determined by his bat. His swing is short for a big man, and he has power from foul line to foul line. Strengths: Speed, body life and balance, arm strength. Espinosa is one of the top two-way players in the country, but he might not get to show it often. Gulliver Prep, another national-title contender, has two premium lefthanded pitching prospects, which puts Espinosa and his 94 mph fastball in the bullpen. More important, it puts him at shortstop every day. His well-above-average arm strength, 6.5 speed in the 60 and overall athleticism give him ideal physical tools for the position. Hes a much better hitter from the right side, but his switch-hitting ability will be another bonus with scouts. Espinosas .526 average led the victorious U.S. junior national team in last years world championships. Strengths: Hands, arm strength, balance, pop in bat. Comparable Player: Alex Gonzalez (Blue Jays). Add Espinosas speed to Montanez tools, and you would create a high school shortstop who could easily be among the first picks in the draft. While Montanez has quick feet and excellent balance and mobility at shortstop, his straightaway speed is below-average, about 7.0 in the 60 and 4.45 to first base. The rest of Montanez skills are first-rate. He plays shortstop with the flair of a player who has the utmost confidence in his hands and his ability to make all the plays. His strength and bat speed are superior to Espinosas. Montanez could become one of the new-generation shortstops who can produce runs and play defense. Strengths: Bat speed, power potential, balance. Weaknesses: Body type, hitting skills. Smith plays shortstop and pitches in high school, but he played a flawless third base at the premium showcases last summer. How well he takes care of his muscular body will determine where he ends up. Smiths 6.7 speed and above-average arm attest to his current athletic ability. But Smiths ticket to the major leagues will be his bat. He has well-above-average bat speed with wood and can turn on any fastball with authority. He has had some difficulty with offspeed breaking pitches, which is not unusual for a hitter from a non-Sun Belt background. Sam Fuld, Phillips Exeter Academy, Durham, N.H. Strengths: Hitting skills, defensive skills, approach. Usually scouts ignore 5-foot-10, 175-pound outfielders with 6.8 speed. Its a supreme compliment to Fulds baseball skills and ferocious attitude that he was a favorite among scouts for first-team All-America status. Fulds raw speed is probably his primary physical weakness. He more than makes up for it with outstanding jumps in center field, both coming in and going back. His arm strength is above-average. He doesnt look like a power hitter, but his bat speed, quickness to the ball and excellent extension give him surprising pop. As a top student at an elite prep school who is signed to go to Stanford, Fulds signability will be closely watched by scouts. Skyler Fulton, Capital HS, Olympia, Wash. Weaknesses: Baseball skills, body stiffness. Fultons tools package is eerily similar to that of North Carolina college All-American Tyrell Godwin. Thats a good news/bad news evaluation. The good news is that Fulton, a top football prospect, is one of the best athletes in the 2000 high school class. He has strong, square shoulders and a sprinters lower half. The ball jumps off his bat due to his strength, and he is a powerful runner under way. Like Godwin, Fultons baseball skills have been held back by his involvement with football, though indications seem to be that he might pass on a two-sport career at Arizona State to concentrate on baseball. His swing mechanics and hitting instincts are the least advanced of his skills, and he could struggle initially with wood bats. His arm is average but could improve as his upper body loosens up. Dave Krynzel, Green Valley HS, Henderson, Nev. Strengths: Speed, body type, overall tools package. Its easy to classify Krynzel as a speed player based on his 6.31-second 60-yard time last summer. Unlike many sprinters, though, Krynzels speed is "usable," in scouts terminology. He gets out of the batters box quickly and already has sound instincts on the bases and in the outfield. His fundamentals have been nicely developed at one of the premier high school programs in the nation. He has a wiry-strong frame that should fill out as he matures, and already generates good bat speed with a slashing, line-drive swing. Interestingly, Krynzel will sometimes separate his hands on the bat handle for better control. His arm is solid average for center field. Krynzel hit .440 with a team-high six doubles and eight stolen bases for the world champion USA junior team last summer. Strengths: Feel for pitching, command, projectability. Its not surprising that Burnett pitches for Wellington High, a Florida powerhouse. Coach Scott Benedict also tutored 1999 first-round pick Bobby Bradley. Both players were judged by Baseball America to have the best command in the nation in their respective classes. Burnetts age, in fact, should make him a high school junior. His recent physical maturation, along with changing his curveball grip to get tighter spin, contributed to a notable improvement in the velocity and sharpness of his pitches. His fastball has gone from 86-87 mph to 89-91 since early last summer. Burnetts best skill is his ability to command the location and speed of his pitches. He has the instinctive ability to adjust his fastball and changeup velocities and locations, making the pitches interchangeable and indistinguishable. Not coincidentally, Burnett tapes or watches as many of Tom Glavines starts as possible. Mike Davern, Brea-Olinda HS, Brea, Calif. Strengths: Power fastball, athletic ability. Davern fits the profile of a power pitcher. He has broad shoulders and hips, and is just beginning to add muscle to his long frame. His fastball velocity improved from 87-89 mph after his sophomore year to 92-94 last summer. He isnt the type of pitcher who will just touch high-velocity numbers, but will sit steadily in the plus velocity range. Daverns curveball needs fine-tuning, but could become a solid second pitch. He gets a tight spin and break on the pitch, but only throws it 68-70 mph. Thats too large a separation to deceive better hitters. Strengths: Fastball velocity, pitching ability, looseness. Weaknesses: Identifying a breaking ball. Harrington has taken advantage of the year-round baseball environment in Southern California to develop into the hardest-throwing high school pitcher in the country. Scouts at a pre-Christmas tournament timed the loose, lanky righthander as high as 97 mph. Coupled with Harringtons raw velocity is an advanced concept of how to locate the ball and move it around the strike zone. Against the Japanese junior national team in late August, he pitched a complete-game victory over a contact-conscious team without recording a strikeout. In addition to maintaining his velocity during the spring, Harrington must work on developing better feel with his breaking stuff. He has thrown both a curveball and a slider during the last year, but tends to throw the curve too soft and the slider too hard. Joe Torres, Gateway HS, Kissimmee, Fla. Strengths: Curveball, fastball movement, athleticism. Torres doesnt have the finely tuned mechanics and year-round pitching program of other All-Americans, but he may surpass them in raw stuff and athletic ability. He is polished enough to have gone 2-0, 2.16 in the World Junior Championship last summer for Team USA. Torres is an above-average athlete with long, loose arms and legs. He throws from a mid-three-quarters release point, which gives his 88-93 mph fastball exceptional sinking and running action. While some pitchers cant get their curveballs over the plate consistently from such an angle, Torres appears to have no problem. His curve has sharp biting action and good two-plane break. Strengths: Projectable strength, leverage, curveball. Weaknesses: Mechanical consistency, injury history. Wheatland joins batterymate Scott Heard on BAs All-America first team, and may also join him in the first round of the drafta distinction that has happened only twice previously in draft history. The 6-foot-5 righthander has a solid average fastball and uses his height to get excellent leverage to the plate. His best pitch, though, is a hard overhand curve that has a late, downward break. Wheatland also plays first base, and even hit a home run at the World Junior Championship. Scouts express some concern over minor knee problems that Wheatland has experienced in the past. Strengths: Fastball velocity and life, athleticism. Miner is one prospect who could potentially hurt his draft status as a pitcher by his work in the field. With an angular 6-foot-3 frame, Miner doubles as the ace pitcher/starting shortstop for a strong Palm Beach Gardens High program. His hustling, all-out style and self-confessed inability to maintain his weight have left him fatigued in the past. When hes fresh, Miner has a live, sinking fastball that can top out at 94 mph. His curveball is a quality secondary pitch that he can throw consistently for strikes. Miner gets some deception from his arm action, which is very short in back but long and loose out front.